Is there a similarly fast alternative to Crtl + Shift + Eject for new Macbook that lack eject keys? The new MacBook Air and Pro without optical drives lack an Eject key. I use Ctrl + Shift + Eject a lot to put my display to sleep at the simple press of three keys. Without the Eject key being there anymore I'm wondering if there's an alternative to those very handy shortcuts which required the Eject key. close the lid of the MacBook Air - puts the Mac to sleep completely and therefore not very useful, when it should keep doing what it's doing. Is there a similarly fast alternative to Crtl + Shift + Eject for new Macbook? Require password immediately after sleep or screen saver begins should be checked in the Security & Privacy in System Preferences panel if you want to ensure a slept screen is also securely locked. The easiest way to lock your computer is to set require password immediately and turn off the display with the following key combination: control + shift + power I find this super helpful and a great replacement for ctrl + shift + delete in Windows. There's a writeup here about using Automator to assign the keyboard shortcut of your choice to lock the screen. If you just need to lock the screen, you can use Control ⌃ + Command ⌘ + Q available since High Sierra. control ⌃+shift ⇧+eject ⏏ or control ⌃+shift ⇧+power ⌽ should instantly put your display to sleep. 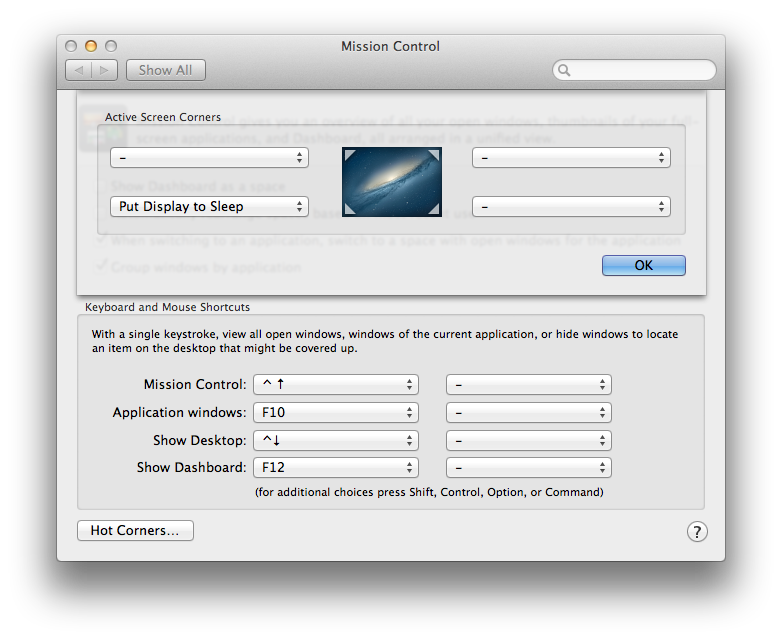 I also recomend you to setup hot corner in System preferences -> Mission control -> Hot Corners. 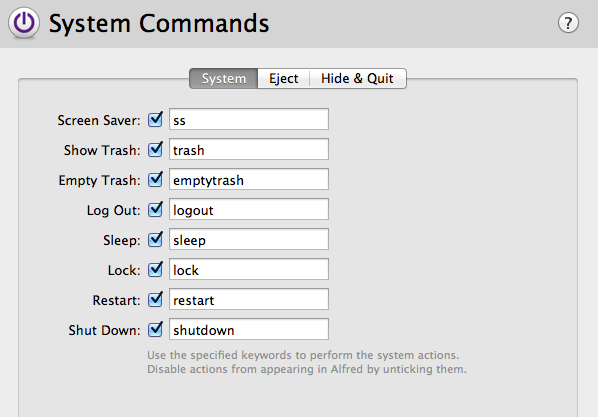 Another quick keyboard option is to use Alfred to perform basic system commands. However, I've chosen to customise my commands to put exclamation marks before shutdown, restart and logout to avoid the risk of accidentally activating them. On my 2018 MacBook Pro with Touch Bar, none of the key combinations mentioned that use the power button (now the Touch ID button) worked. I can press that button whenever the BetterTouchTool Touch Bar is expanded. It behaves equivalently to the old Ctrl+Shift+Eject shortcut – it puts the display to sleep immediately, without locking the screen or putting the computer to sleep. When configuring the button, I gave the button the name “Put Display to Sleep” and set the icon to this blank screen icon from Icons8. The action I assigned was BetterTouchTool’s predefined action “Sleep Display”. Are you just trying to put the display to sleep, or to lock it? If you're just putting the display to sleep, turning the brightness down all the way works as well. BTW Control+Shift+Power does NOT work on my MacBook Pro 10,1 (Retina). On Mavericks (OS X 10.9) I can just use the Power button to put the display to sleep. I've tested this on a Mid 2011 Macbook Air and a late 2013 Macbook Pro. On Mavericks, simply press the power button to put the display to sleep or Ctrl-Shift-Power works as well. To put your machine to sleep, use Cmd-Option-Power. My current solution is to use a third-party program to assign a custom keyboard shortcut to an action that puts the display to sleep. The program I use to define the global shortcut is Keyboard Maestro (costs money), but many other apps can do that, including the free program Quicksilver. 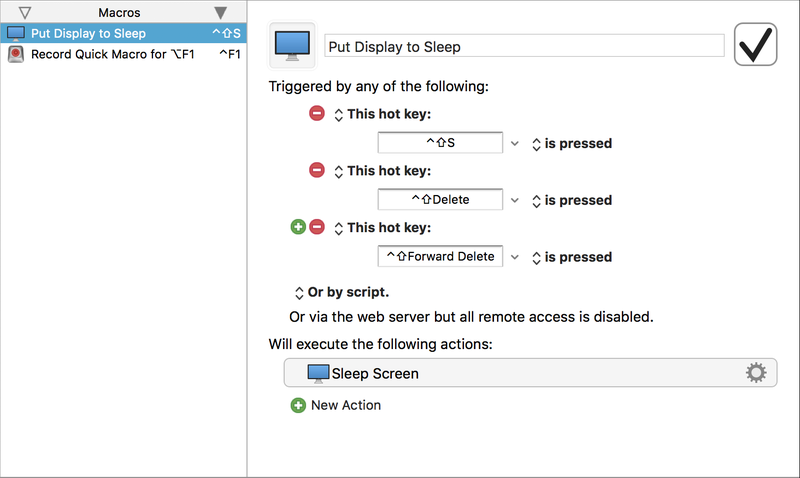 Or, if your keyboard macro program has a built-in “Sleep Display” or “Sleep Screen” action, you can use that as the action instead, as I did in the above screenshot. I would have used the hotkey Ctrl+Shift+Touch ID / Power, but it seems like macOS doesn’t let programs listen to presses of the Touch ID / Power key. Not the answer you're looking for? Browse other questions tagged macbook screen-lock eject . What Is the Keyboard Shortcut for Sleep Display Without Eject Key? How do I do control-shift-eject on a MacBook Air? How can I sleep the display from Terminal? How to lock screen on MacBook Air? How do I require password prompt EVERY time I close my MacBook's lid? Is it possible to program an OS X screen lock? Replacing shortcuts that use the eject key on MacBook Air lacking such a physical key?